It is your responsibility to return the item(s) to Awesome Legging Store. Awesome Legging Store shall send your exchanged leggings back at no charge, one-time (domestic only). Subsequent exchanges are the responsibility of the customer. 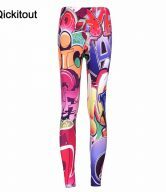 Awosome Legging Store will send you your exchanged item(s) upon receiving your package within 24 hours. If the item you are looking to have exchanged for is out of stock, we shall notify you by email or phone as to the availability of the item. 2. Please write in detail which items you want exchanged. Refunds: Upon receiving your return, Awesome Legging Store will processes your return within 48 hours from receiving your package. Items will be inspected and processed through our returns department. Refunds are not issued for worn, washed or altered items or for items that are Final Sale. Refunds will be issued to the original credit card used for purchase or in the form of store credit. We are unable to switch refunds to a new or different payment method other than what was originally used on your order. Shipping is non-refundable, except in cases where we have made a shipping error. A restocking fee of $5.00 per package is applied for all returned packages. You will receive a full refund if your item is not received. As defined by our terms and conditions, an item will be considered “not received” if the item has not been received 30 days after the estimated delivery date. If an item has been damaged during shipping, keep the item and all packaging material so we can file an insurance claim with the shipper. If you’ve done all of this and you still have not received your refund yet, please contact us and we will investigate. Before returning your product, contact us for the return shipping address. If you are requesting a replacement product, depending on where you live, the time it may take for your replacement product to reach you may vary. You should consider using a trackable shipping service and/or purchasing shipping insurance.